Earlier this year, I travelled to the Philippines for three weeks. 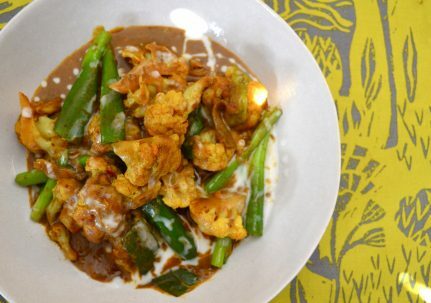 It wasn’t a conventional choice for South East Asia, which typically conjures up images of island retreats in Thailand and Bali, or the culture-rich destinations of Cambodia and Vietnam . In fact, prior to going myself I knew very little about the Philippines and I certainly couldn’t recall any friends or family having visited either. As an avid bargain hunter, I’ll admit that this story begins with tantalisingly low airfares. I love a good steal, and spotting return flights from London to Manila for £411 warranted a double take. And boy, am I glad I took a second look. 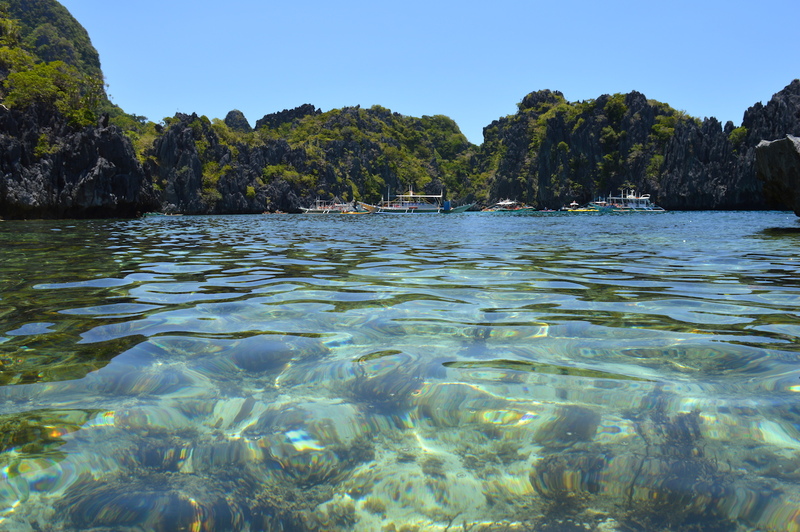 Beyond the chaos of Manila, the Philippines is one of the most beautiful and interesting places I’ve ever visited. It’s not nearly as touristed as other parts of South East Asia, which means that even relatively popular sights, spaces and beaches don’t feel overrun. I can still recall the excitement that zipped through me when I scanned the travel section of a Waterstones to find that the cover of the Filipino Rough Guide was graced by a majestic sea turtle. As if this lovely creature was not enough to persuade me, a quick flick through the guide revealed that the Philippines was a colourful, diverse and vibrant land with jaw-dropping natural scenery. 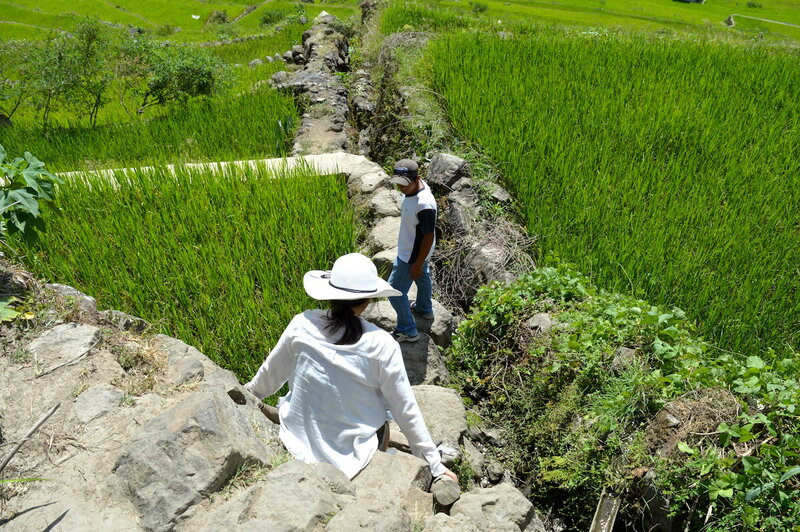 One of the major draws was the opportunity to visit the rice terraces in the Cordillera region. These 2,000-year old terraces are carved like densely carpeted steps into the side of the Ifugao mountains – an astonishing feat of human engineering, skill and endurance given that they would have been built by hand. I was fascinated by these terraces: I could not begin to imagine how many grains of rice I had consumed in my lifetime, and yet I only possessed a patchy understanding of where rice comes from. Even though my parents worked in rice paddy fields in their youth, I had never fully appreciated the real graft that underpins the farming of every grain of rice. Perhaps this is why it felt so special to visit the rice terraces. 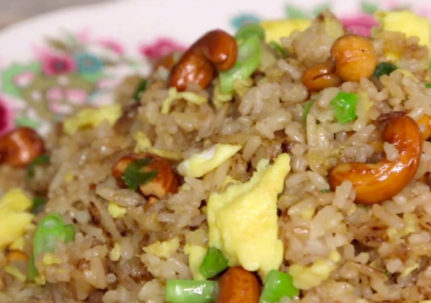 I finally got to see first hand how one of the world’s most important staple foods, and indeed the most significant grain in my own life, begins its long journey from the farm to our chopsticks. 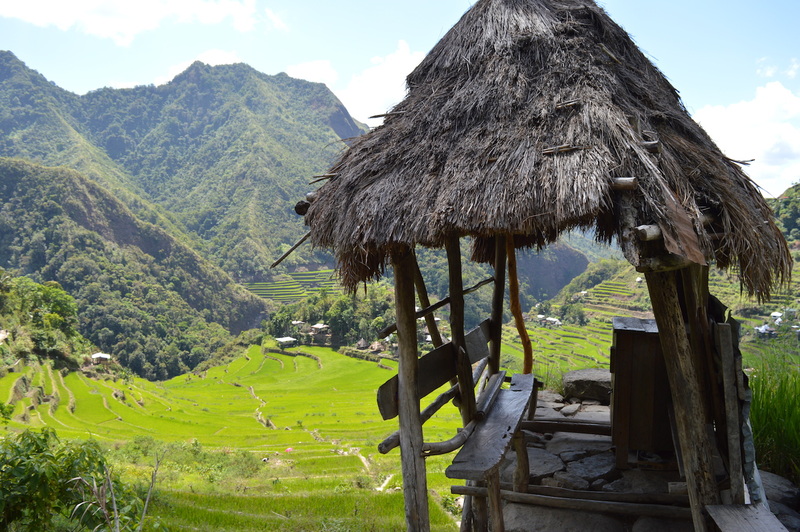 I spent a full day exploring the Banaue and Batad Rice Terraces. 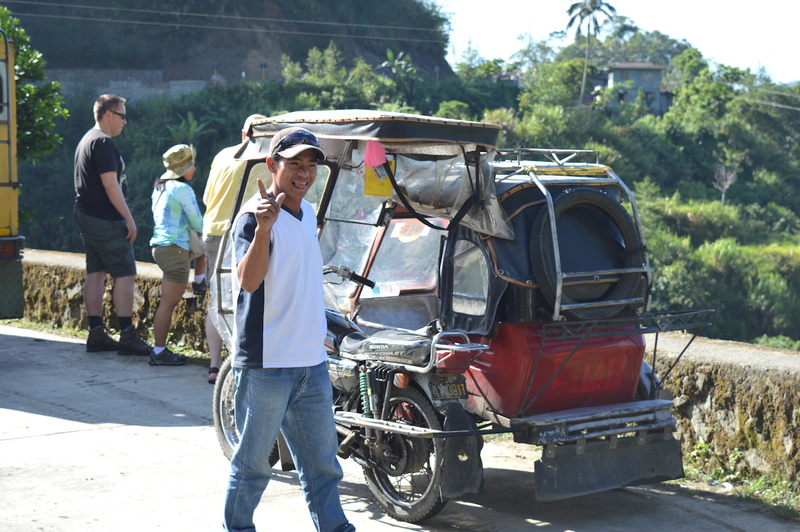 Although there are some slightly more established operators around, I found a terrific guide in a local trike driver named Jackson who I’d developed great rapport with in the previous days spent pottering around the small town of Banaue. I knew I would be in safe hands with Jackson’s big smile, kind nature, and expert local knowledge. At the viewpoints, Jackson explained that the terraces are split into plots owned by different family groups. 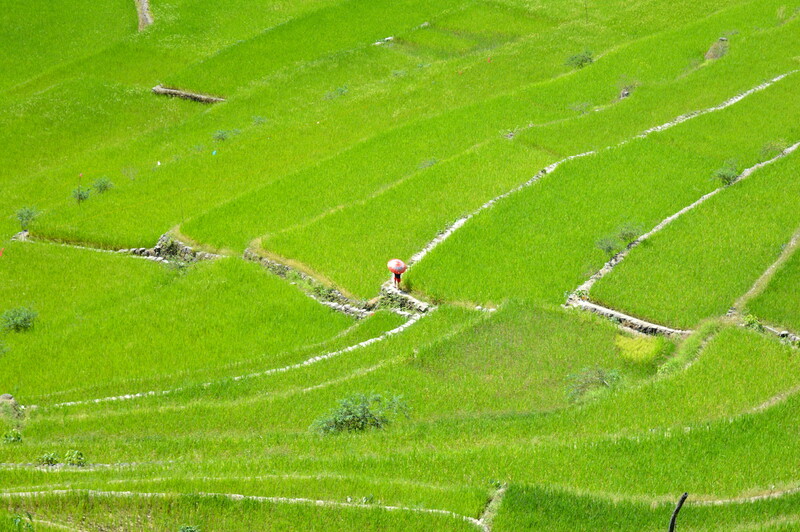 Fascinatingly, most of the rice grown on these terraces only feeds the families that grow it. A small proportion of surplus-to-requirements rice is sold at the local market, and Jackson wasn’t aware of any wider exporting. This fantastic model of self-sufficiency reminded me that I really must commit to growing more of my own herbs and vegetables. 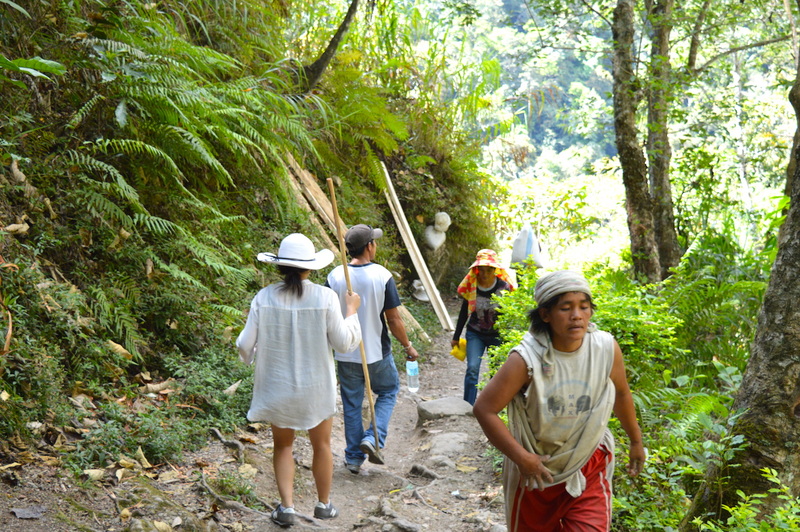 As we ventured into the terraces, I was impressed by how the local kids and workmen (sometimes carrying sacks of cement mix!) skipped up and down the steep steps in their flip flops. Visitors like myself took a more ‘leisurely’ approach. The reward at the halfway point was a cool swim in the clear rippling waters of Tappiya Falls. This was a sight for thirsty eyes, and a much needed pit stop before we took a deep breath and started the long climb back up. On the way home, Jackson spontaneously pulled his trike up at a local family’s home. From a distance he had spotted some traditional harvest tools by their front door that he wanted to show me. 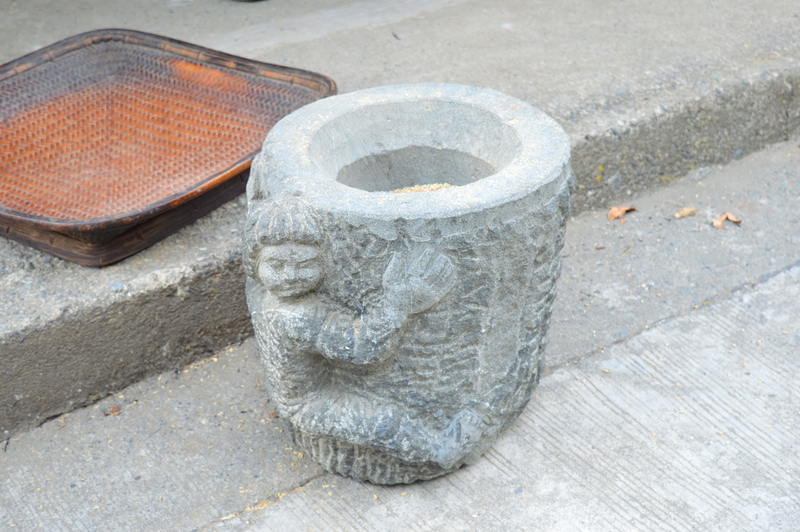 He explained that a large two-piece stone and wood tool, which resembles a giant mortar and pestle, is used to grind away the husk from the harvested and dried rice plants. 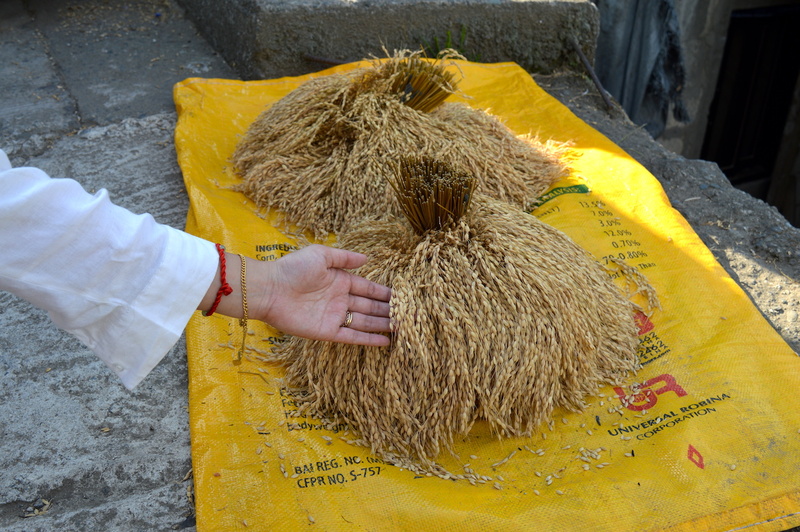 The contents are poured into the large flat woven trays, then ingeniously tossed at the flick of the wrist so that the featherlight husks are carried away by the wind, leaving the ready-to-cook grains behind. At this point, after many months of hard work, the grains were finally ready to cook and eat. Jackson’s parents still farm rice on the plot that has belonged to their family for as long as anyone can remember. 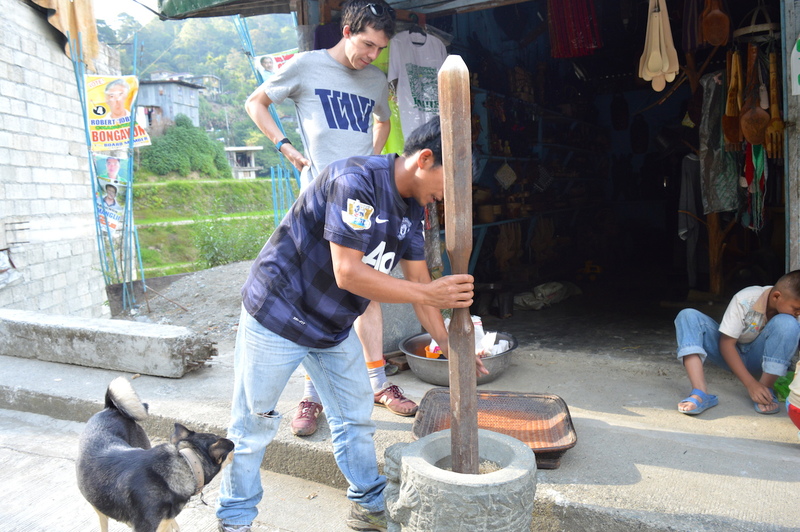 But like many young people, he is also pursuing the exciting opportunities afforded by the growing tourist trade. 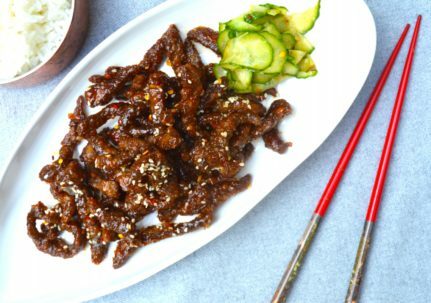 Although Jackson still dedicates some time to working on his family’s farm, many other young people are abandoning the tough farming tradition altogether in favour of more lucrative paths in hospitality. This is problematic because the terraces require constant care and reconstruction in order to retain their stepwise profile, and by extension, their suitability for farming rice. 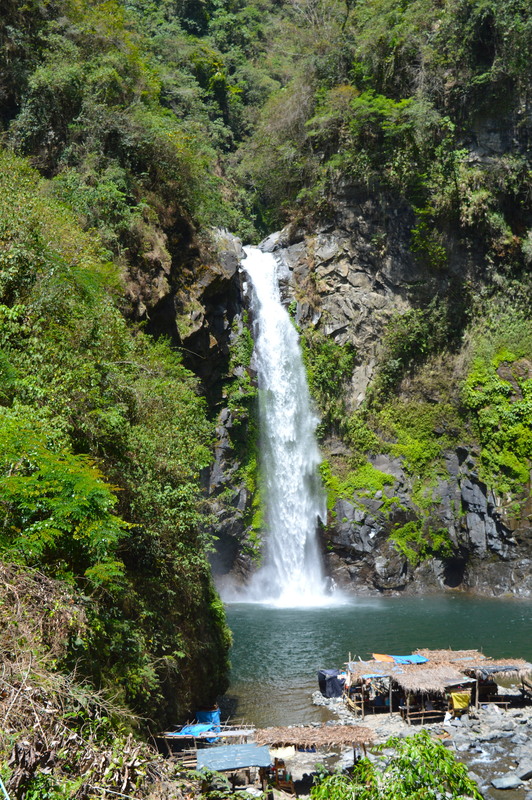 To that end, I did see a number of plots on the outskirts of Banaue that had sadly fallen into disrepair. Thanks so much Karen! 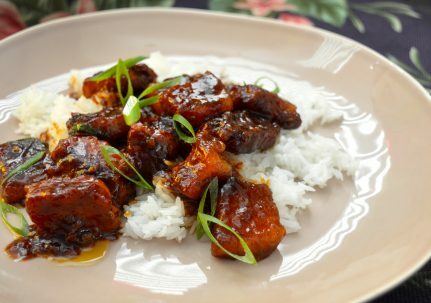 I really liked the Filipino food – one particular favourite was pork belly adobo! Sensational! And pancit!! I love your videos on wonton and dim sum ( in the Philippines, we call them SIOMAI. Like yours). I am in that time of year again, when all I want is those two. And your YouTube videos are wonderful to watch, fast and easy to follow. Thanks so much Glory! 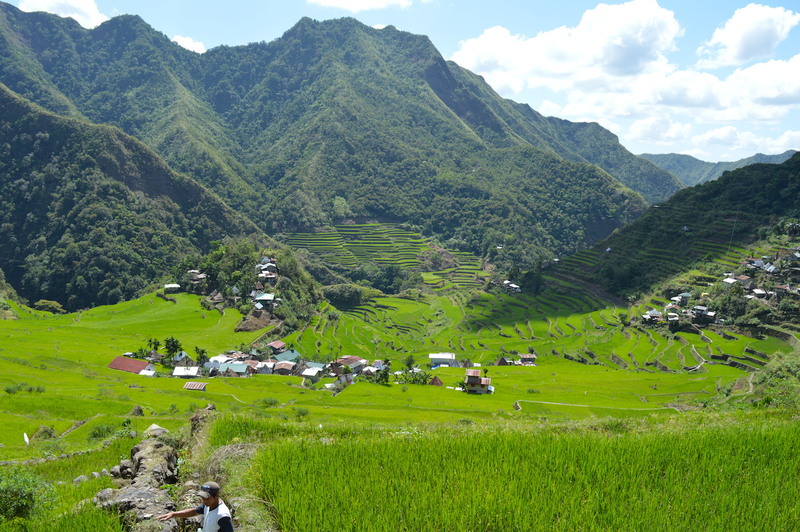 I loved the visiting the rice terraces and the Philippines in general was amazing.